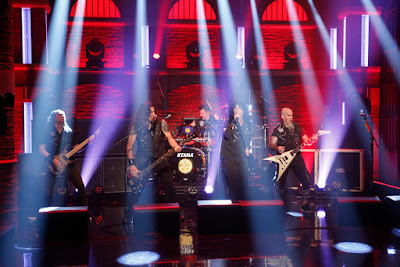 Anthrax performed their current single, “Monster At The End,” on NBC-TV’s Late Night With Seth Myers on August 24. The band recently released the tune from their latest album, “For All Kings,” on colored vinyl in lilac, silver, black and gold. Produced by Jay Ruston, the group’s 11th album debuted at No. 9 on the US Billboard 200 earlier this year with opening week sales of 34,000 units. Anthrax will team up with Slayer and Death Angel for a fall North American tour that begins in Cleveland, OH on September 9. "We are very excited to tour again with our fellow Kings Slayer on a thrash/metal extravaganza," says drummer Charlie Benante. "Two of the Big Four – now that's a night of metal for all the Kings and Queens!"